​Multirotor Micro Aerial Vehicles (MAVs), systems with a diameter of less than 1m and weight no more than a few kg, are among the prevailing aerial robotic configurations of our times. The reasons behind this outstanding success are related with the mechanical simplicity and robustness, flight performance and agility, payload capabilities and more. Multirotor MAVs are also relatively easy to model mathematically. A great deal of complex aerodynamic phenomena that one has to account during conventional helicopter modeling are negligible in small multirotors. In fact, Multirotor MAVs can be (at least for control purposes) modeled as simply rigid body systems on which the lift and drag forces of their propellers act. Rigid-body dynamics studies the movement of systems of interconnected bodies under the action of external forces. The assumption that the bodies are rigid, which means that they do not deform under the action of applied forces, simplifies the analysis by reducing the parameters that describe the configuration of the system to the translation and rotation of reference frames attached to each body. Video: Performance of a Nonlinear Model Predictive Controller during a propeller loss, designed using the presented model of the hexacopter MAV. The two basic coordinate systems utilized to describe the vehicle’s motion are: a) the B Body-Fixed-Frame (BFF), which is attached onto the Unmanned Aerial Vehicle’s (UAV) Center-of-Mass (CoM) and rotates & translates along with its motion, and b) the W World-Fixed-Frame (WFF) which is commonly assumed as a flat earth frame. Those are visualized in Figure 1 below. Figure 1: Coordinate frames used for the modeling of the Micro Aerial Vehicle and forces acting on it. The rigid-body  approach is typically followed to derive the dynamics of multirotors: The aerial vehicle’s structure (as well as the propellers’) is supposed to be rigid, and the BFF-origin is selected such that it coincides with the CoM. The active forces and moments (either by external sources such as gravity and aerodynamic drag, or generated by the multirotors’ actuation authorities) are then appended onto this rigid-body of total mass and moment of inertia  matrix J . The geometrical reasoning behind the structure of matrix A is shown in Figure 2. Figure 2: Configuration for a multirotor aerial robot with n=6 rotors. 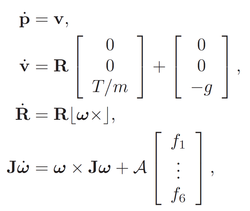 the sum of which becomes negligible for a non-aggressively hovering symmetric multirotor MAV. with Λu, Λω diagonal matrices, such that these relationships reflect the fact that the forces and moments contradict (and effectively damp) the aerial vehicle’s current motion. M. Kamel, K. Alexis, M. W. Achtelik, R. Siegwart, "Fast Nonlinear Model Predictive Control for Multicopter Attitude Tracking on SO(3)", Multiconference on Systems and Control (MSC), 2015, Novotel Sydney Manly Pacific, Sydney Australia. 21-23 September, 2015. K. Alexis, G. Nikolakopoulos, A. Tzes “Model Predictive Quadrotor Control: Attitude, Altitude and Position Experimental Studies”, IET Control Theory and Applications, DOI (10.1049/iet-cta.2011.0348). Note: This Section was prepared in collaboration with Dr. Christos Papachristos.